LOS ANGELES—Many aspects of American history have been musicalized, but there’s never been a musical like this one. Allegiance relates the story of the Japanese-American internment during World War II, decreed by President Franklin D. Roosevelt’s executive order on February 19, 1942. The United States entered World War II after the Japanese bombing of Pearl Harbor on December 7, 1941. A broad national consensus, with few dissenters, heaped doubt and suspicion onto the 120,000 Japanese Americans in the U.S., many of them citizens born in this country. By that order they were forced to leave their homes, farms and properties, take with them only what could be carried in a single suitcase, and be shipped to far-off concentration camps scattered mostly throughout the Western states. Allegiance is a co-production between East West Players, the nation’s longest-running professional theatre of color and the largest producing organization of Asian-American artistic work, and the Japanese American Cultural & Community Center, one of the largest ethnic arts and cultural centers of its kind in the U.S. Producing Artistic Director Snehal Desai of East West Players directed the musical, bringing real character to what in some hands might be somewhat stereotyped roles. Why a musical? Takei wanted this story to be “accessible and engaging to the largest audience possible.” An interview with Takei can be viewed here. Takei is also an openly gay man, whose husband Brad took the name Takei in his honor, and he has been a prominent voice in the struggle for LGBTQ rights. 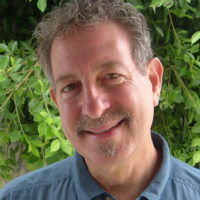 When the musical began development in 2008, premiering in September 2012 in San Diego, it had value mostly as a historical reminder. But since the election of Donald Trump, Allegiance has become more potent as a statement of resistance to oppression on many levels. The story begins and ends in the year 2001, at a time of summing up in the life of the now quite elderly Sam Kimura (George Takei, who also plays the role of Sam’s grandfather Ojii-chan in the middle narrative portion of the musical). The Kimura family are forced to leave their farm in Salinas, California, and are sent to the Heart Mountain internment camp in the rural plains of Wyoming. The prisoners (really there’s no more accurate word for them) are subjected to hastily built communal housing with vermin, no running water, latrines, poor medical services, freezing winters and dusty winds, violent armed guards, and constant humiliation. The song “Gaman” refers to the Japanese concept of resilience and fortitude, finding the strength even to find beauty in ugly circumstances. It’s a principle that will frequently come in handy. The characters are the extended Kimura family and other residents of the camp, a sympathetic white nurse Hannah Campbell (Natalie Holt MacDonald), Hakujin (Jordan Goodsell, who plays a number of incidental white male characters), and Mike Masaoka, a historical figure who was the national secretary and field executive of the Japanese American Citizens League (JACL). The JACL was reviled in many circles for being apologists for the internment, but it defended itself saying there were no other available options under wartime conditions. It preferred to lobby quietly out of view for Japanese American rights while publicly, and sincerely, acquiescing as loyal Americans to government policy. Among the rights it fought for was the right to enlist, a marker of full citizenship as it has also been for other groups, including most recently, LGBTQs. Midway into the internment, which lasted through the war, the government asked all Japanese Americans to fill out a questionnaire with two fateful items that answered either way could put a person in a heap of trouble. Question 27 asked if you were willing to serve in the United States armed forces and defend the country against its enemies. Question 28 asked if you would swear unqualified allegiance to the United States and forswear any allegiance to the Japanese emperor. If you answered “Yes, Yes,” you could be subject to the draft and called up to serve, even as your family members were being held prisoner in a faraway concentration camp deprived of their Constitutional liberties. If you answered “No, No,” you could be charged with being a hostile alien and sent to a federal penitentiary or labor camp. The musical focuses on the terrible rift these questions created within individual families and within the larger Japanese-American community. Generational as well as political factors influenced people’s thinking. Accusations of “coward” and “traitor” are hurled in anger toward close relations. Sammy Kimura (the younger version of Sam, played by Ethan Le Phong) is eager to serve and prove his loyalty, which earns him the contempt of his own stubborn father Tatsuo (Scott Watanabe) and many others in the camp. He gradually begins a flirtatious relationship with Nurse Campbell (see Nellie Forbush in South Pacific), who reciprocates the feelings. That is one of the two love stories (hey, it’s a musical). Sammy joins the 442nd Regiment Combat Team, made up entirely of Japanese Americans who were sent into dangerous war zones in Europe on what some would call “suicide missions.” The 442nd became the most decorated unit in World War II, such was the eagerness of these soldiers to prove their American-ness. Frankie Suzuki (Eymard Cabling), a law school graduate of USC who knows his Constitutional rights, belongs to the “No, No” camp, and for his trouble he is brutally beaten and sent off to Leavenworth. He is in love with Kei Kimura (Elena Wang), Sammy’s sister, so the ideological and emotional split, sadly lasting generations, runs right through the family. That’s the second love story. What’s the music like? In the first place, there’s pit band of eleven musicians led by Filipino-American music director and keyboardist Marc Macalintal. The soaring Broadway voices, amongst the cast of fifteen, show their artistic mastery of the genre, as also verified by their bios in the program (ten of the fifteen are Actors’ Equity members). The couple of dozen songs in the score by Jay Kuo, to the book by himself, Marc Acito and Lorenzo Thione, effectively serve their moments in the action, and are reprised as needed. Several are real knockouts. The creators have taken pains to make a few of these numbers play multiple purposes. For example, “Our Time is Now” (with a deep bow to Stephen Sondheim’s similar song in Merrily We Roll Along), celebrates the crucible moment when loyalties—allegiances—are tested. Both sides of the questionnaire legitimately feel this is their time to grasp the demands of history. This ensemble number also reminded me of the “Tonight” scene in West Side Story, in which all the characters give voice to their quite different anticipations for the evening. In other songs, such as “What Makes a Man” and “Higher,” gender becomes more robustly defined as these teenagers step up, empowered, to adult responsibilities. Sammy’s song contained echoes of the stirring “The Impossible Dream” from Man of La Mancha. “Get in the Game” recalled the team-spiritedness of Damn Yankees. The “442 Victory Swing” in close three-part male harmony obviously summons up the Andrews Sisters’ “Bugle Boy of Company B”—and not so subtly reminds the audience of the gay presence in the war. Throughout there is a melding of Japanese musical motifs into the overall Broadway character of the score. Allegiance does not presume to make its mark as music. “Wishes on the Wind,” the first number in the show, is almost formulaic in introducing the central drive of a musical theater work: to establish what the characters want. Its innovative aspirations are more directed toward the historical and thematic, which is truly original. The audience (on March 22) enjoyed it tremendously, as I did. I trust many of them were equally moved by the factual story, which was likely a revelation to many of the younger theatergoers. George Takei deserves a nation’s gratitude for pursuing this project so devotedly. 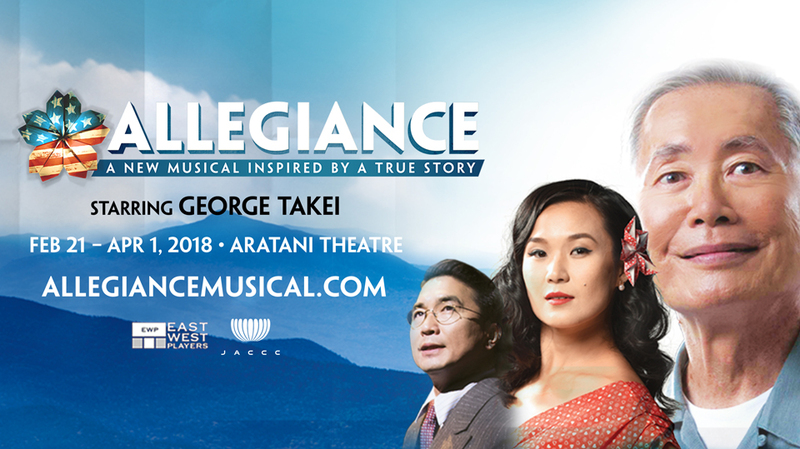 In some ways, it occurred to me, Allegiance represents a kind of foundational narrative for the Japanese-American community as Fiddler on the Roof is to Jews: This is where we come from! Most importantly, Allegiance refuses to take sides in the questionnaire debate. Those who resisted (“Resist” is one of the musical numbers) were “as much heroes as those who went to fight,” according to Takei. As someone who served a brief jail sentence myself in an act of anti-war resistance during the Vietnam era, I appreciated that! A trailer for the musical can be viewed here. On the way home we drove through Skid Row—thousands upon thousands of homeless people (58,000 in Los Angeles at latest count) walking, conversing, sleeping in the rain, or if they had one, in a tent. Does America always need a despised, subhuman underclass, these “prisoners” of extreme poverty? A musical like Allegiance offers a prayer that things might get better, but “Gaman” alone won’t work. 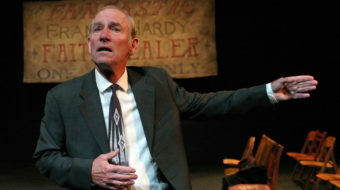 Allegiance plays Thursday through Sunday through April 1 at the Aratani Theatre, 244 S. San Pedro St., Los Angeles 90012. For more information and tickets, go here.